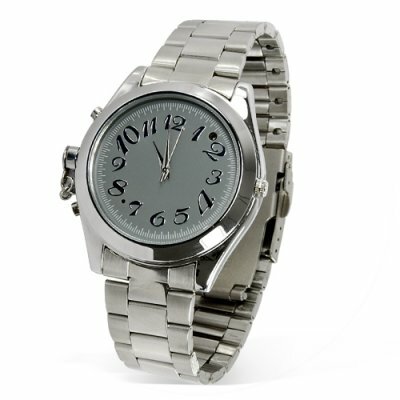 Successfully Added 8GB Business Watch - Stainless Steel Strap (Audio/Video) to your Shopping Cart. Business watch with stainless steel strap and 8GB of memory for super covert audio and video surveillance. This new model of watch has a stylish face plate and band that lets you record videos secretly and in style. Do you need to keep an eye (and ear) on someone without their knowledge? Record a conversation without letting anyone know? Secrely capture a meeting on video? This item may be your new favorite surveillance tool. With 8 GBs of storage capacity, clear video image, and good quality audio recording all packed into a compact size, this 8GB Business Watch makes it easy to covertly record videos with audio. This is the best way to record all your meetings, interviews and on the spot discussions without letting anyone know they're being caught on camera. This model offers you the chance to record both video and close range audio simultaneously. All the features of this 8GB Business Watch are packed into a compact size no larger than a regular high class wristwatch. The watch itself features an attractive stainless steel body and strap, a stylish face plate, and bold, easy to read numbers. Its modern design and full stainless steel body make it look like a modest priced designer watch. This model is a real, fully functioning watch, and comes with accurate gear driven time in seconds, minutes, hours and a twisting crown for setting the time. It goes great with business suits and casual wear as well. With an attractive design, good quality recording, and 8GB of memory, this 8GB Business Watch just might be your best new surveillance tool. And with an irresistiblly low factory direct price, this item is great for resale in your store or online shop. Buy a sample to test out and then buy in bulk to save more, straight from your best source of wholesale electronics, Chinavasion. Does this watch also record audio? Yes, it records video files with audio. What is the best recommended range for audio recording? To record clear audio, the closer and louder the better (works great for interviews) and records best within a range of 6 meters. How do you know when you are recording? To record, hold down the button on the bottom left for 2 to 3 seconds. A small green LED light will illuminate, then flash, then turn off. Once the green LED turns off, the watch is recording. How do I stop recording? Hold down the same button on the bottom left and you will see the LED indicator flicker RED and switch off. Once the red LED turns off, the watch is no longer recording. How many hours of footage can I store on the 8 GBs of flash memory? The camera wrist watch can store up to 14 hours of video with audio.